Is it just me, or has this week felt like the longest ever? It has been raining here pretty much nonstop since Monday night which has certainly put a damper on things...it looks like the weekend ahead should be clear, though! Today I'm linking up with the lovely Five on Friday ladies! 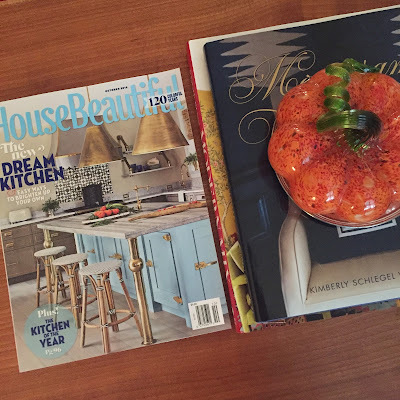 If the weather doesn't take a turn for the better and things stay gloomy outside, I wouldn't mind curling up with this latest issue of House Beautiful! That kitchen...mega swoon! I majorly need that island in my life...and those pendants. Speaking of kitchens, Bryce finally agreed to paint our cabinets white, something I've dreamed of for years! As long as I agree to keep our front door black, he's okay with us doing the interior painting projects I've been wanting for quite some time! I'm not sure how quickly we'll get around to it, as the house needs a few other things worked on first, but I am documenting it here as proof to hold him accountable to our agreement! Last week we were listening to Van Morrison radio while cooking dinner, and the station was killing it! Several Chris Stapleton songs played during the course of the evening and I think he now counts as my new music obsession. Are you a fan? I am seriously struggling with the fact that fall weather isn't quite here yet. It finally feels cool enough today that I'm wearing my riding boots. On my fall wish list this year is: a plaid, non-blanket, scarf, a cream colored Patagonia vest, and some trendy clogs! What's on yours? Since starting my new job, I've been eating more salads. I pack my lunch most days, rather than going out or home, and have been trying to make big salads that I can eat throughout the week. 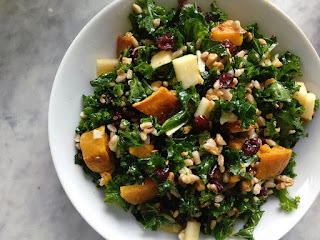 I am dying to make this Ultimate Fall Salad with kale, butternut squash, and farro! I think some crispy prosciutto would also be a great addition! What are your favorite salads that stay good throughout the week? 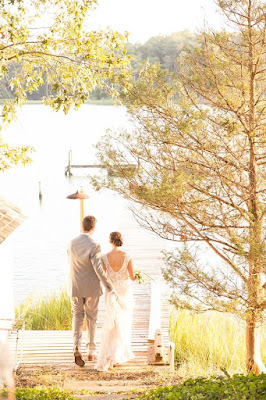 How gorgeous is this sneak peek of my UVA bestie Anna's wedding!? I can't wait for all the pics to be revealed in the next few months! Standing by her side all weekend was so special and it was an incredible weekend! I can't wait to share more details with you! Happy Friday! We are finally getting just a touch of fall here, too! Not quite cool enough for riding boots but I'm sure that is coming. That fall salad looks amazing! That photo is gorgeous! I'm SO over the rainy dreariness that's been in the DC area. Enough!!! :) Gimme all the Fall clothes! I found the perfect plaid non-blanket scarves at Target! The ones online say "blanket scarf" but really it's just a longer regular scarf - not square! Good luck with the projects this weekend! Love this 5 on Friday! I'm struggling with non-fall weather too and I don't think we'll be getting it for awhile as we're still in the mid to high 80s. I guess I won't be complaining in the winter though :). Can't wait to hear more about the wedding!